It's almost the end of silly season, mid-August, 2014. But this summer has been anything but silly. It's been nonstop terrifying. Gaza, Ukraine, Syria, Iraq, ISIS, US-Mexico border. Ebola and, now, Robin Williams gone too soon. There's more, but I don't want to think any harder right now. It's raining and the bed looks so inviting, so safe. Time for something frivolous that will make you prettier, New Best Friends Forever. When the times are bad, look good. 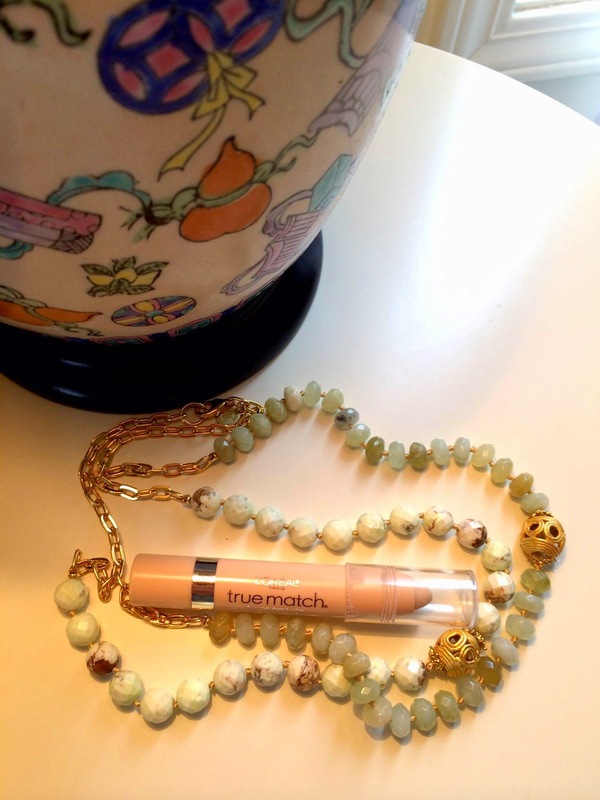 L’Oréal has come out with another great product: True Match Super-Blendable Crayon Concealer. You can keep this nifty little wand in your pocket, dab it everywhere and it blends in and lasts and lasts. What more could you want? In the picture above I've plonked the concealer in the middle of this beautiful necklace from One King's Lane, their "Relaxed Romantic" collection, an exact description of how I don't feel this August, 100 years after the start of World War I. The pretty jewelry is a gift from my daughter, Lucy, which she gave me for no particular reason. Just for fun. Carpe diem. We love One King's Lane. I can't open the emails from them anymore, the stuff is so good. Stiff upper lip everybody. The world is scary. Smile. Wear jewelry. Conceal everything.